Walter Lewis Elder of Chattanooga, TN passed away September 30, 2018. He was born November 2, 1937 to the late Adam and Lillie Mae Elder. He was preceded in death by his brothers, Leon Elder and Robert Elder. 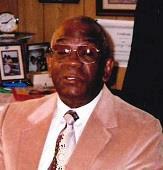 He was a veteran of the U.S. Army and retired from Tuftco Corp after 30 plus years of service. He leaves to cherish his memories sister, Charlene Pasley; brothers, John (Bettye), George (Audrey), James, Reginald (Delores), Stanley (Vickie) Elder all of Chattanooga, TN; sister-in-law/caregiver Althea “Gail” Elder; a host of nieces, nephews and other relatives and friends. The body will lie in state after 12 noon Thursday, October 4, 2018 at the funeral home. A funeral service will be held at 11:30 am on Friday, October 5th in the funeral home chapel with Patrick Martin will be doing the discourse. Interment: Chattanooga National Cemetery. Arrangements by John P. Franklin Funeral Home, 1101 Dodds Avenue, 622-9995. So sorry to hear of your loss. As the days go pass may you experience the love of our heavenly Creator Jehovah God as he strengthen you and your family to get through this trying time. (Psalms 83:18) Remember he loves your loved one also and has promised to get rid of sickness and death forever and by means of his son Jesus Christ, bring back to life our loved ones. (Revelation 21:4; John 5:28,29) Please accept my deepest condolence jw.org website for more encouragement.